No, believers exercise freedom under grace and, as such, the church is no longer subject to the requirements of Old Testament Law. We give of our time and of our material provision by faith, cheerfully and generously, limited only by ability and/or desire. Even if a Christian wanted to tithe as directed by the prophet Malachi, they would be unable to for, among other things, the Temple no longer exists. And while some may try to draw comparisons of the Temple to a church building, that temporal similarity does not substantiate translating the tithe and offerings of Malachi into the New Testament church requirements. Perhaps a more accurate question should be, “Is a Church administration acting under biblical principals in requiring a tithe of its members?” Many ministries in err appeal to Malachi 3:8-10 to support that requirement and to guilt its membership into compliance. The answer to this question is again “no”, they cannot require a tithe of its members and claim biblical support. However, a church administration does not violate biblical principals if it requests monetary gifts from those who benefit from its ministry. But let me be clear, tithing is not a means to gain mercy or favor from God. The teaching that God can be manipulated by our works is not supported by scripture, in fact, the Bible teaches against this false teaching. Yes christians are suppost to tithe because the bible.For the bible says in Malachi that man robs God in tithes and offerings.If we as christians do’nt tithe then how is the kingdom suppost to flurish? How are we to keep the lights on at the church or fix the leaking roof if there are no seeds to upkeep Gods temple? ghostwriter, please provide a clear exegesis to support your premise. The passage in Malachi was referring to a tithe of grain to be collected for the purpose of providing food and resources for the nation of Isreal during famine. The church is not a building as the Temple was. And the directive was given specifically to Israel at a time when they had turned their back on the Lord. If you want to draw comparisons, you need to support them with scripture by appealing to biblical principals taught in the passage. Malachi does not support your false teaching. I think you are way off base and wrong in this teaching!!! Tithing is said in the bible the one time God says we can test him and that is with tithing He says if you give the first 10% of everything then you will be blessed with your wildest dreams coming true. You are teaching false things!!! You are applauding a false teaching!!! Talk about faulse teaching who have you been learning from.Can you back up what your rambling with scripture? I think not.In the intire old testiment they gave a tenth of something.And since you want scripture, here we go.Genisis chapter 28 verse 22,Leviticus chapter 5 verse 11, Leviticus chapter 6 verse 20,Numbers 5 verse 15,1 Samuel chapter 8 verse 15.Two quarts in those scriptures equal out to one tenth offering.You should have known these scriptures, but you may have ripped the pages out.I tryed to be nice but you would’nt let me.Well since you CLAIM to know the bible then you should know that 2 Timothy 2 verse 16 says to STUDY to show yourself aproved unto God a worker who does’nt need to be ashamed, CORRECTLY TEACHING the word of truth. But i guess that was one of the pages you ripped out. The context of this verse is Jacob had just experienced the vision of the ladder and angels. When he awakes, Jacob sets the stone his head had been laying on as a pillar and memorial. In this verse, Jacob is making an oath to give God a full tenth of all that the He gives him. This oath is not made of compulsion or of obedience to any law as the Law had not been given yet. Jacob’s promise of a gift to God was conditional on God’s provision and protection for him. He basically said, “If you will do this for me, I’ll do this for you.” He was bargaining with God! This is a perfect example of how not to give. The context of this passage is outlining the requirements of sin offerings as Moses commanded of the Israelites. The church does not offer sin offerings, for Christ was our perfect sacrifice once and for all. Hebrews 10:1-4 “For the Law, since it has only a shadow of the good things to come and not the very form of things, can never, by the same sacrifices which they offer continually year by year, make perfect those who draw near. Otherwise, would they not have ceased to be offered, because the worshipers, having once been cleansed, would no longer have had consciousness of sins? But in those sacrifices there is a reminder of sins year by year. For it is impossible for the blood of bulls and goats to take away sins.” The Law according to Hebrews has been fulfilled and replaced with the law of Christ, the law of love. Leviticus 6:20 “This is the offering which Aaron and his sons are to present to the Lord on the day when he is anointed; the tenth of an ephah of fine flour as a regular grain offering, half of it in the morning and half of it in the evening. The context of this verse is outlining the law of the grain offering which was to be burned entirely by Aaron and his sons. There was to be nothing left of it to be distributed or consumed. This offering is not comparable to the monies collected by the church to support building maintenance and church staff. The context of this verse is a grain offering of jealousy to determine the guilt of a woman if her husband suspects her of infidelity. This verse couldn’t be farther from the purpose of the church collecting tithes. Did you read this before suggesting it as support for your view? The context of this passage is Samuel addressing the Israelites who demanded a king from him. He is prophesying that, among other things, the king will collect a tenth of their grain and fruit and give it to his soldiers and servants. This is not a favorable prophesy as Samuel concludes, “Then you will cry out in that day because of your king whom you have chosen for yourselves, but the Lord will not answer you in that day.” Nevertheless, the people refused to listen to the voice of Samuel, and they said, “No, but there shall be a king over us, that we also may be like all the nations, that our king may judge us and go out before us and fight our battles.” 1 Samuel 8:18-20 This verse does not support your view either. I challenge you to choose even one of those passages and exegete it. All of those commands are for the Israelites under the old covenant. You have a task before you to show just application for the new covenant church to submit to a law commanded of someone else entirely. Attacking me does not translate into support for your premise. Stick with the issue and stop hiding behind personal attacks, it does not become someone who claims Christ. No one was attacking but you sure are defensive!!! You asked for it with your smart remarks. I just gave you what you were asking for.You must have just learned what exegete means,but its ok Im glad to see that you study.Since you want to throw out biblical interpretation do you know what christian escotology or hermeneutics or eisegsis is.You see i did’nt comment to start a war of words just to have good convo. The task is not on me i study for three hours a day.That does’nt mean that i know everything, i just know what im talking about because i study and get confermation from God before i speak.We are going to be judged by God from the whole bible not just the new testament. While the subject itself interests me greatly, I must admit that I’m distracted from the real issue after reading the posts. The passage I would like to share has absolutely nothing to do with tithing/giving/offerings. It’s so easy to get “heated” in the midst of a disagreement. We all understand that…especially when it involves the Word. It’s possible though to disagree completely and even be able to prove one’s point scripturally and passionately….while still speaking(or writing) with an air of kindess and respect for each other as God’s precious creation. I agree and well said but she is wrong in her teaching of not to tithe. But look out if you disagree with Nancy. This can be such a ‘tough’ subject among believers…….I appreciate how bold you are about it. My husband and our last pastor had a ‘discussion’ about this very thing……my husband being on the side that you are and supporting it with the same Biblical evidence that you use here. I have researched believers who adhere that the tithe is not required under the new covinent. 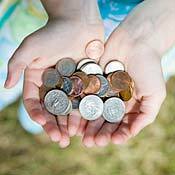 Many propose that if it were no longer ‘preached’ the church would suffer greatly financially. I know that the Lord knows my heart when I give, He knows whether or not I am obedient in giving what He leads me to, and, He knows what is sacrificial giving for me……..and that is not going to be the same amount/percentage for all of us. If I am misinterpreting scripture then it should be very easy for you to expose my errors, which as a brother in Christ you should do. I invite you to hold me accountable to the truth. You are not going to hurt my feelings if you hold me accountable to the Word, ghost. Why don’t you start with the verses you mentioned and demonstrate how they teach your view? Thank you for your transparent heart and your honest comments. You touch on several vital points that I would like to expand upon. First, in the passage where Jesus is refuting the Pharisees to give unto Caesar what is Caesar’s and to God what is God’s, the nation was still under the old covenant Law. If you want to draw from scripture what the Lord commands of giving under the new covenant, study the actions of the church after Pentecost. Giving was always determined by the ability and desire of the giver and the need of the receiver. So by these standards, you are giving according to biblical principals. The tithe of the OT served as a tax of food, a requirement of the nation to store up in the Temple to provide for the Levites and for the needy. It was not a collection of money. Nothing about the administration of the church or the function of the church compares. The church is not a building, it is a gathering. The church does not compel members to gather food for redistribution; it gathers monetary gifts to support ministry and missions. The church is not motivated by submission to Levitical Law, it is motivated by love. Secondly, you use the same wise principals to choose who and what you wish to bless with the time and funds you have been entrusted as the early church did. Wisdom determines your choice and you have that choice because you are free through Christ to bless as you are able and as you desire. Our old pastor did not preach on tithing and he had good reason not to. The Christian teaching of tithing sets an objective standard for your gifts that is not supported by Scripture. God does not require our tithe, He requires our faith. When you give sacrificially, you do so out of faith not out of duty. You are blessed because you are acting in faith, not because you have filled a requirement of your faith. There are many people who give sacrificially and live in poverty. Do not be deceived. Material blessing is as much of a test as poverty, perhaps even greater test according to Jesus. Wealth exposes our love. Wealth can keep a man out of heaven, not because money is evil, but because the love of money is evil. Finally, more money doesn’t make you better; it only makes you more of who you already are. If you are generous, financial blessing will make you more generous. If you are greedy, financial blessing will make you more greedy. It is a magnifying glass of sorts, like any other test, to reveal our hearts. So we give because we love, not because we are told to, not because we are guilted to, not because we seek glory. We give because we love our God and our brothers and our neighbors. When the church sets a standard for our gifts, it is robbing us of operating in faith and of the joy that comes from freely blessing God as He has blessed us. Way to go! Nice comparison between the church and the temple and very true as well. All the hype and emphasis on tithing in today’s church truly breaks my heart. It reflects how little today’s church understands salvation. I have heard all sorts about tithing from many well-respected preachers and it makes me sad, really sad. I have heard a preacher say non payment of tithes is worse than the sin of adultery, I have also heard another one say that those who do not tithe would not get to heaven and they endanger the lives of others in their midst just like Achan in the book of Joshua. Bizarre! Isn’t it? To tell the truth, many that teach tithing would not want to listen to what we have to say about it and it is very serious. I have heard of people that have been kicked out of their church because of it, others, like me have been ostracized in church because they do not agree with the it. I guess we just have to keep praying for them and us as well. I saw your post on the trinity and was really tempted to comment but I was not quite sure how you would receive my views so I thought it best to keep quiet. I had a bad experience on another blog regarding my views on the trinity. Anyways, keep us the good work and God bless you. I have a question for all of you. those of you who believe that you MUST tithe. Have you received financial blessings from tithing MONEY. Those of you who do NOT believe that you must tithe. DO you receive financial blessings when you do not tithe MONEY. And yes I am judging your answers as the fruit that you are baring. I have a question for you. Where in the Word does God promise financial blessing if a believer tithes, or even if a believer gives to a ministry or mission? You won’t be able to find it, otherwise the poor Macedonians must have been exluded from that promise as well as the rest of the early church. Your question does sound a bit naive. You seem more concerned with the end result than with the process. Because a thing seems to work does not make it right. You do not receive financial blessings because you do or you do not do something, you receive it because of God’s grace. 43″No good tree bears bad fruit, nor does a bad tree bear good fruit. 44Each tree is recognized by its own fruit. People do not pick figs from thornbushes, or grapes from briers. 45The good man brings good things out of the good stored up in his heart, and the evil man brings evil things out of the evil stored up in his heart. For out of the overflow of his heart his mouth speaks. I however am inclined to agree you on several points esp about the requirements of the early church versus the new church of christ. I do believe that the lord has called his people to prosperity that they should be blessed that they may be a blessing to others and I have learned that to receive the blessings from The Lord one must devote his time and his money. My question is really this simple do we tithe the 10% as most churches require and also give offerings on top of that or do we give as The Lord places on our hearts to do so. The above verse plainly states we are to GIVE! here is just some of the scriptures on Prosperity my belief is based on the truth. “Submit to God and be at peace with him; in this way prosperity will come to you. If they obey and serve him, they will spend the rest of their days in prosperity and their years in contentment. You know this to be true already you just want a fight. The scripture on giving IS about tithing and giving alms. It is from Luke as testimony to the CHURCH. GO argue to your hearts content this is not what I came here for I wanted to know what and how other Christians are giving and how the Lord is blessing them for it. You are a thorn in my side and no help at all. A theoretical argument has no objective standard by which to measure the truth. You and I fortunately do not have to resort to shooting in the dark to establish our beliefs. We have the Word of God to determine truth. So lets examine the verses you have quoted. Are they teaching that if I give to the church, that I will be materially blessed as you have asserted? In this chapter, Eliphaz is joining the chorus of the rest of Job’s “friends” in accusing him of sins that they say caused Job’s calamity. You and I know that Job did not suffer because of a judgment upon him. God chose Job for suffering because he was righteous. Much of Job’s friends accusations were proven to be erroneous as Job answered his friends’, and later as God answered Job. The translation you are quoting has translated the noun form of the Hebrew adjective “good” as “prosperity”. Other translations use the phrase “good things.” The message of Eliphaz is similar to the message of wisdom in Proverbs. The wise heed the wisdom of God “yielding to the Lord” and do not suffer as the foolish who justly suffer as they live in opposition to the “good”. Rather we enjoy peace with our Holy God. The righteous, however, do suffer in this world because we co-exist with evil. Evil has access to us, although it does not have authority over us. Notice Satan had to have permission to afflict Job. If you wish to know what is the “good” that believers receive as they obey the precepts of God in giving generously and with a cheerful heart, your answer is in the message of Eliphaz and in the gospel itself. A believer is content in all things, but the material provisions this world has to offer never satisfies a person whose hope is in heaven. Material “blessing” is a test just as poverty is a test. The purpose is to reveal the heart, to us and to others. As you said, the fruit reveals the truth. God does not promise me material blessing because I give generously, nor do I seek it. Abundance does not satisfy. Abundance is a means to glorify my Holy God and to reveal His holiness and lovingkindness to a lost world. God does not promise us temporal satisfaction, He promises eternal peace. Now as far as my requesting that you support your beliefs with scripture, I am certainly justified in encouraging you to do so. As a sister in Christ, it would not be loving of me to allow you to continue believing something in err, nor would it be loving of you to allow me to believe in err. Because we are children of righteousness, we should seek the truth in all things, including our beliefs. That in no way is a criticism of your faith. We all believe errant things because we are falllible creature with fallible understanding. How glorious it is that we can search for the truth in all things in humility together and encourage one another in our faith at the same time. you are not in authority to question my faith to me. YOu can question it to any one else you like. You love to argue for the sake of arguing and maybe that is what this site is about. My mistake I realize that I willnot find the answer i seeking at this site. You are a good sister in Christ. Yes I am questioning the Prosperity Movement. I do not aspire to be rich. Only to have my needs met by Christ’s riches and glory. I am facing what must be the most difficult days in my life. the Lord is pressing me forward. even as I am close to losing all material possessions and even my license to work. The lord has delivered my husband after 25 years of praying and crying to the lord My husband has finally embraced Christ just this morning. I do have a desire on my heart to bless others and what I want to do will take alot of $$$. SO I am praying and fasting and seeking the lord with all I have in me. Not only to save my family and myself from financial ruin but to allow me to be a blessing to others by granting the desires of my heart. And there in lies the crux of the question I have asked what are other Christians doing how are they giving and how is it working for them. I ask because I really do not see how tithing is the answer. By the way I do believe Ce Ce had the right answer. I am grieved that you are suffering financially. Many people are walking this path with you, although some do not have the Hope we have. I am not exluded from that rather large group as my husband’s company closed in January. You are right, tithing is not the answer. We cannot manipulate God to rescue us from our poor choices or from the sinful actions of others. But God is faithful as we seek His face and His wisdom. True healing is not in the physical or temporal cessation of suffering. Our faith blossoms in the wait. It is in the absolute assurance that our pain is redeemed for good that we have hope. I counsel many people who are grieving the loss of financial security, and I will tell you the same thing I tell them. This can be the worst or the best thing to ever happen to you. It all depends on how you walk it, Jenny. Walk in faith, dear sister. When you grow weary, know that your brothers and sisters in the faith are lifting you up. Finally! I wholeheartedly agree with all you’ve said on tithing. After some research I’ve come to the conclusion that tithing is not a requirement under grace. It should not be law, nor be used to prosper a mega church. However we can, in good conscience and heart help the church we attend, give to others in need. Yes, we should be generous, but we should not be coerced into giving what we sometimes cannot afford. I have heard of Christians not paying their mortgage in order to tithe. I have also attended a church where the Pastor once said that the more we give, the more we will receive from God. And if we are in financial troubles it is because we have not given enough… in times of trouble we should tithe even more. It saddens me to think that in that church members were made to believe that by tithing and giving, the doors of heaven would open to bless them. I like this blog. Hope to read more of it very soon. Thanks for stopping by, Wilhelmina! If you have a blog, I would love to check it out. Join in the discussion anytime!